Summer is here. While in many countries that means parks full of picnickers dining on wine and cheese, cafes spilling onto sidewalks and sunbathers snatching every ray of sunshine, in Korea it signals mass retreat into air-conditioned, shady coffee shops. Why? To get at the bingsu, of course! This cool, sweet, chewy and crispy dessert is a more-than-adequate summer companion. This shaved-ice dessert comes in many incarnations, most famous of which is the pat bingsu - “pat” being the red azuki bean that is found in so many Korean sweet treats. But green tea, fruit and all sorts of combinations get the bingsu treatment - although they, too, contain the “pat” in all but name. 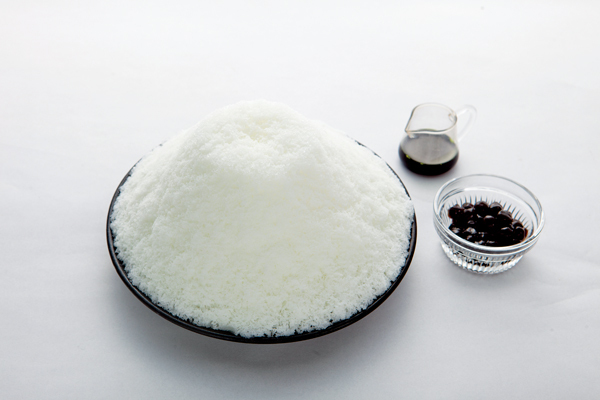 While the exact ingredients vary, you can typically expect a layer of shaved ice to be topped by fruit, ice cream, nuts, cereal, candy, and rice cake. The bowl is cavernous and some of these ingredients will remain hidden until some way in. 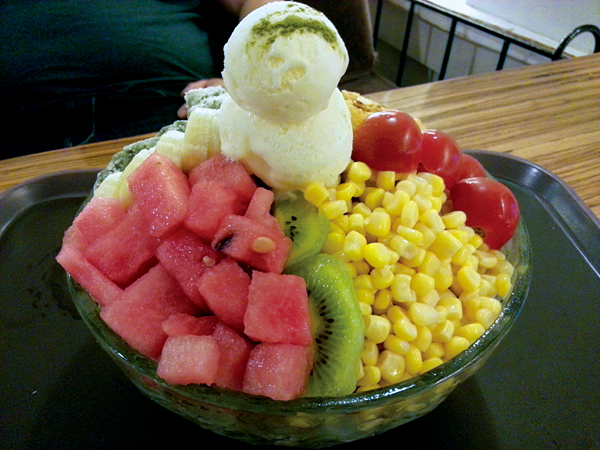 Although one swallow doesn’t make a summer, one bingsu certainly does. Whether the first sighting is as a smiling co-teacher walks into the office, arms hugging the ubiquitous plastic container, or when one among your company scoops your arm, drags you down an alley, before entering an inconspicuous doorway for a slurpy treat, the bingsu certainly signals a seasonal change. Bingsu has a culinary culture of its own - a group of high school kids, heads bowed, going at a bowl from multiple directions can only be described as Serengeti-esque. Whether you should mix first, or chisel away at the edges is also an oft-discussed - and controversial - topic. The saliva-swapping faint of heart need not attend, as the once-perfectly presented dessert becomes a slosh of slush, being dive bombed by plastic spoons barely clear of voracious tongues and lips. As the dregs are left, only the brave remain - not perturbed by the swilling multicolored creamy concoction. Like a lion eyeing a wildebeest, you are clearly eager to get stuck in yourself, so here is The Weekly’s guide to some of the best bingsu on Jeju Island. A classic patbingsu popular with high school students, this has five main toppings: fruit, mugwort rice cake, cornflakes, sweetcorn. You can add or remove toppings, choose the ice thickness and opt for redbean refills. A cult favourite among the Jeju housewives - don’t try to get a seat on a Friday night! - this bingsu is dominated by a mountain of green tea ice cream sprinkled with almonds, rice cake, and red beans. Cookies are complementary. This is a unique persimmon bingsu using sweet and ripe persimmons and a snow-like ice topping on red beans. Dried mandarins are provided post-bingsu. 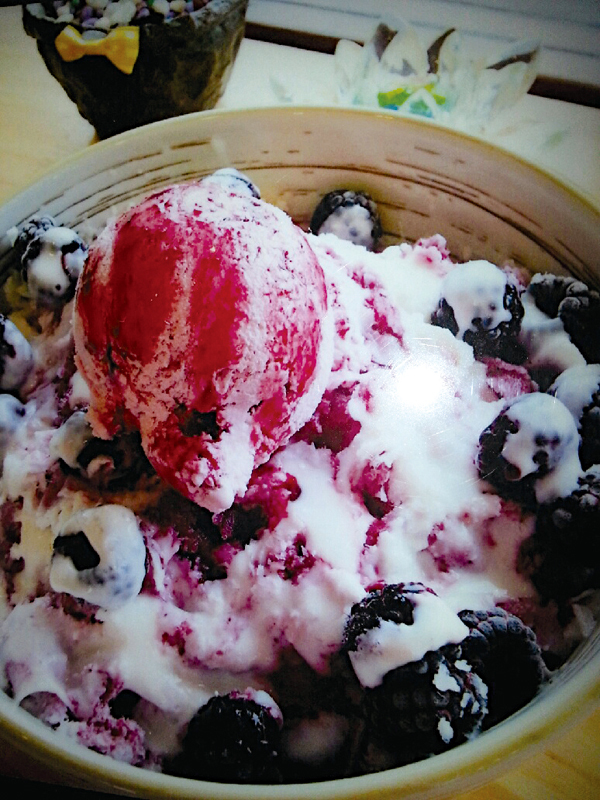 This bingsu is chock full of mugwort rice cake - healthy, chewy and delicious! Yogurt ice cream is the creamy addition and red bean and cereal, also. Korean black raspberry bingsu is the favorite here. Made with organic fruit, this bingsu is fresh, healthy and sump-tuous. 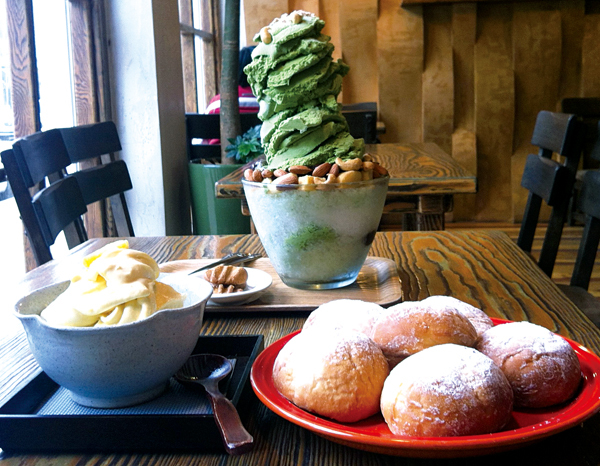 Malcha is finely ground green tea and this bingsu also includes iced milk. The milk makes the bingsu really soft and the slight bitterness of the green tea harmonizes with the creamy milk. There is also chewy rice cake, cereal and red bean. Made from red wine boiled with fruits and cinnamon to leave no alcohol trace, both young and old can sample this. It is topped with blueberry and raspberry.